This is a completely customized Chicago Cubs theme wedding cake topper ordered by one of our customers. Since it is a rush order, we have no time to design 2D drafts, that is why there are no 2D drafts above. 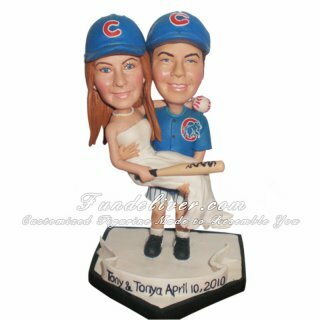 They would like a sport "Chicago Cubs" theme wedding cake topper with groom carrying bride. 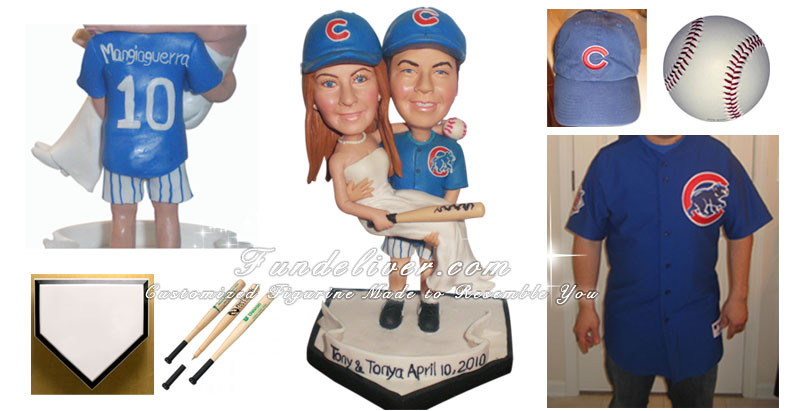 Both figurines wear Chicago Cubs hats and the groom wears blue Chicago Cubs jersey, white and blue pinstripe shorts. They would like the back of the jersey to have #10 on it, fitting their last name (Mangiaguerra). The bride wears a nice strapless wedding dress (however do not have the dress flowing to the ground, only to her feet; they do not want the jersey or background covered up by the dress). They want to be standing on home plate with the bride holding a baseball and a bat leaning against the groom with a ribbon in the front to read "Tony & Tonya April 10, 2010".